IMAGINE going on a holiday up to the hills by toy train  the narrow gauge trains built by the British, that still chug slowly up the Nilgiri hills in the south, and the Shivalik Mountains in the north. Travelling by one of these is like stepping back into the pages of history, in remembrance of those days of yore when these quaint trains were the most fashionable mode of transport. When the oppressive heat of the plains forced British residents to move to the hills, they took toy train from Coimbatore and in three-and-a-half hours they were chugging into the Ooty Railway Station. It still takes the same amount of time, but if one boards the train at Metupalyam, a small town at the foothills of the Nilgiris, the journey can be made in just an hour-and-a-half. There are first and second class coaches on the train, the first costing a princely sum of Rs 65/- and the second an unbelievable Rs 9/-. The Nilgiri Express leaves Coimbatore early in the morning, and it is still fairly early in the morning when you reach the tiny Ooty station. One of the few hill-stations with a well maintained race course, during the season, hordes of punters travel up to this racing venue, where even if you loose, the weather helps to keep you cool. Ootacamund, or Ooty as it is popularly referred to, is the most convenient get-away hill resort from Bangalore. As the industrial importance of Bangalore and Coimbatore grows, traffic through Ooty also keeps apace. In the past ten years, the population has grown ten-fold and is now almost 2 lakh over 7,500 feet above sea-level, Ooty often referred to as the "Queen of Hill Stations", was established by John Sullivan. An Officer of the East India Company, John Sullivan the Collector of Coimbatore between 1815 and 1830, was the first Englishman to reside at Ooty. "The Stone House" built in 1822 by him, was the first residential House to be erected by Europeans in Ooty. The original walls of the house are intact, hit over the years there have been many modifications. There was originally a beautifully landscaped garden surrounding the house. This was given away to the government and houses a liberal arts and science college. Establishing a city from scratch was not easy for either John Sullivan or his family. His wife, son and daughter all died before him and are buried at the historic St. Stephens Church. Johan Sullivan left for England soon after their death, and passed away himself in 1958. A tablet in his memory can be seen next to the graves of the other members of his family. Another landmark in Ooty is "The Nilgiri Library". Inaugurated in 1858 and situated on Commissioners Road almost in the very centre of the town is this library. Other buildings of the same vintage can be seen within 100 yards such as the post office, the district court, the collectors office, Higginbotham book shop and St. Stephens Church. The library houses over 25,000 books  fiction and non-fiction, a collection of classics, books on travel and some rare books on the history of the Nilgiris. Temporary membership is possible in the season which is in April, and May. Visitors to Ooty can while away many pleasant hours in the peaceful interiors of the library, browsing over a wide selection of Indian and foreign magazines and newspapers. The Ootacamund Club was originally constructed as a hotel by Sir William Rumhold and inaugurated in 1833. Lord Bentinck rented it as a private residence the following year, and thereafter it reverted back to being a hotel till 1836, when it was acquired to form a club. The club is the oldest of its kind in the entire district and has all the original furniture. 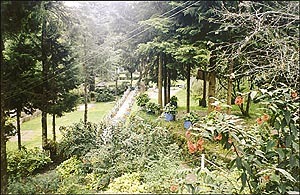 Its well-kept gardens and lawns are the pride of Ooty. It is said that the game of snooker was invented for the first time in the world at this club. The original snooker table is still there  beautifully kept and popular with members. The Todas, the traditional inhabitants of the Nilgiris, have lived on these hills for centuries. 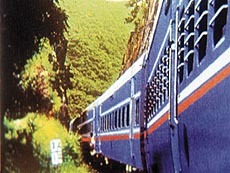 However, their contribution to the development of Ooty is negligible. Their presence today is almost non-existent, and there are very few Todas, Mundas (hamlets) to seen on the slopes. Trying to trace Toda origins or crafts is a difficult experience. There is only one government-run sales emporium at an important intersection of roads, known as Charing Cross, where their distinctive embroidery is sold. As in other tribal craft, the Todas embroider in red and black on a white background. What is unusual, however, is that the embroidery is done in wool on a cotton background. The reason given is the fast colours in red and black in cotton yarn cannot be guaranteed. Among one of the oldest buildings in Ooty is St. Stephens Church. 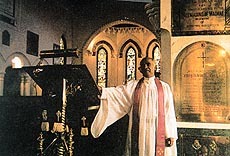 It is the oldest church on the Nilgiri Hills and its foundation stone was laid in 1929 by the Governor of Madras, Stephen Rumbold Lushington. Large beams are reputed to have been brought from Tipu Sultans palace at Srirangapatnam, and hauled up the hill by elephants, for building the church, consecrated in 1830 by Bishop Turner of Calcutta. In 1851, a clock tower and in 1894, nine tubular bells were added. The pipe organ was also enlarged from time to time. In the church compound there are memorials and graves of many eminent people, including those of the Sullivans, mentioned earlier. One of the more scenic spots in Ooty, is the Botanical Garden. No one who sees this magnificent landscaped area would imagine that the origin of this garden was a common kitchen garden. The credit for developing it to its present state goes to the Marquis of Tweedale, who with the help of a skilled gardener from Landers Kew Gardens, created this beautiful garden in 1847. Now considered one of the finest in Asia, the garden houses over 2000 species of flowers and trees, from all over the world. Some of the rarest orchids and plants may be seen in the green houses, providing considerable inspiration to Botany enthusiasts. In the middle of the garden is an artificial mini-lake where a fossilised tree trunk, reputed to be over 20 million years old, can be seen. On the eastern side of the garden can be seen a typical Toda hamlet  a rare sight indeed, providing a rare insight into the ways of the original inhabitants of the Nilgiris. The annual flower show in the month of May, is definitely the best time to visit Ooty, when the gardens are a riot of colour. But what of the new Ooty? As the old order changes, the old familiar shops at the main shopping centre, are giving way to emporiums and fast-food centres. On Council Road, bang opposite Kishenchand Chellarams  Ootys oldest and largest department store  have sprung up new constructions with pseudo modern facades, selling everything under the sun. Kishenchand Chellarams still sport signs that say "All your requirements under one roof" and "Self Selection  only one of its kind in the country". While most of the items being sold are obsolete, it is the only place in Ooty with a cold storage, stocking excellent park products and other frozen meats. Among the most popular restaurants is "Shinkows"  an authentic Chinese restaurant which serves the most delicious "Chinese cuisine". Situated in the old quarter at the junction of Commissioners Road, next to St. Stephens Church, the restaurant seems part of the old gracious style of life, that epitomised the Ooty of yore. The fast food fever has not left Ooty untouched. "Kurinjis" situated opposite Kishenchand Chellarams, does a brisk trade in instant dosas, bhaji-puris, burgers and pizzas. It is popular with families for a quick bite, or a cooling drink when walking up Ootys steep slopes, becomes too hot. Just opposite Kurinjis is "Iranis Hotel Brindaban" another of the old familiar restaurants of Ooty. Serving both Indian and continental, vegetarian and non-vegetarian fare, it is popular with those who want more than a snack, for a meal. Most visitors make a beeline for the Ooty Lake, where boats can be hired by the hour. Except on particularly warm days, it can be chilly on the Lake. But it is still one of the pleasantest ways to spend an afternoon. Warmly clad, sitting in a boat, wafted by the cool breeze from the lake watching the world go by.